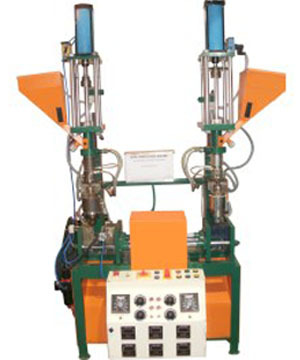 Dave Technical from India has developed a fully automatic, pneumatic, single phase, double station blow molding machine, DSBM-01 series, which is said to be the world’s smallest. The patented machine has two parison units, available for the first time in the world, that is able to produce two different products of two different polymers having different shapes, size and thickness as required simultaneously at the same time. Even two products with different colors can be produced concurrently on this machine if required, according to Dave Technical. The new line is fully automatic, pneumatic without motor and works on air pressure using compressor, providing considerable power savings and adapted to operate on both single phase as well as three phase power, therefore suitable to be installed even in rural areas. It is fitted with universal platen to accommodate critical shaped volume molds for production of a wide product range on same machine. Variable weight adjustment system in head and Option of PLC (micro processor) based controls are available. Easy to operate, Dave Technical says the machine is suited for production of small blown products, critical items that is not economical on large complex machines. Products as small as 0.2ml and thickness as low as 0.2mm can be manufactured. As said, the machine can handle a wide range of materials including low density polyethylene (LDPE), linear LDPE (LLDPE), high density PE (HDPE), polystyrene (PS), high impact PS (HIPS), ethylene vinyl acetate (EVA), thermoplastic elastomer (TPE), polypropylene (PP), etc.